Genealogical Services Offered | Welcome to Past Perfect Genealogy Research! I offer a free, 30-minute, no obligation consultation call or email to discuss your genealogical goals. If you decide to consider hiring me as your researcher, there is a non-refundable fee of $125.00 (4 research hours) payable prior to the start of your project. This initial research period is significant as it is when I evaluate the complexity of your goals, review the ancestral data (client forms) provided to me, and evaluate the amount of time it will take me to meet your needs successfully. I will form a research plan to best solve your missing ancestral puzzle pieces. I also do lookups for Santa Cruz County, California for $20.00 per hour (not including fee for records found). I can photograph a loved one’s headstone, find probate files, land records, or local obituaries, to name only a few of my local services. 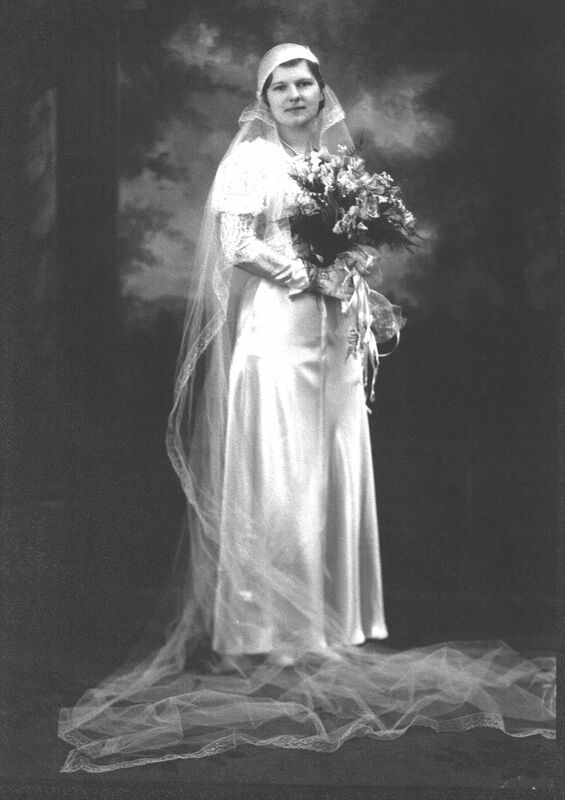 My grandmother, Mary Yugovich (Jugovic), on her wedding day in 1934. I only work on one or two projects at a time. I very carefully keep track of the time spent on each client’s job. Although a project may take months to complete, much of this time is spent waiting for vital records or information from repositories. If your research requires international records, additional waiting time and patience is crucial. Many countries take weeks to respond to a genealogical request. Sometimes, when clients are in an extreme rush, my services can be expedited. The cost of vital records is not included in my fee. A record can cost as little as $3.00, or as much as $60.00. I only order records which I strongly believe will benefit my clients. I love what I do, and I live for making clients’ dreams come true. I will work hard for you from the very first phone call until the final results are your hand. I also offer the option of preserving your results in a coffee-table quality, leather-bound book. These family books are usually done for clients who have had at least four generations researched by me. These family books have beautiful, colorful, glossy pages, and contain anywhere (on average) from 50 to 200 pages. But, again, these books are very personalized and depend completely upon what data and history you want preserved. The book can contain family stories, photos, headstone photos, relevant historical facts, vital record documents, family tree charts, descendant charts, famous ancestors, etc. Again, one can customize the family book – it will definitely become a family heirloom! The cost of preparing the book varies depending on the complexity wanted by the client. The details each client desires in his or her family history book will be thoroughly discussed prior to preparation and publication. It’s all about what the client wants! I will be happy offer professional suggestions and advice as to what these needs may potentially include to make the ancestral book beautiful and be cherished for years to come. The hours of work and dedication it takes to prepare your family’s ancestral and historical doesn’t included the cost of printing the book. Printing an individual book usually costs $100.00 to $300.00. The cost of creating familial ancestry books is not based on an hourly rate. These books can take many hundreds of research hours, so a negotiated price will be cleared before work begins. I’ve composed books that have cost clients’ $500 all the way to $5,000. However, the cost really very much depends on what YOU want to see saved for your generations to come. You will find my rates are extremely competitive. Clients for whom I have created a book have been thrilled with the results. They are quite beautiful and full of personal history. If you are curious about the possibility of having your own family’s ancestry preserved in a “coffee table style” book, please ask me for references from past clients. 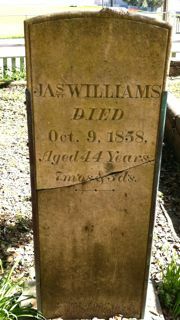 Thank you for considering me to be your family’s genealogist and historian. 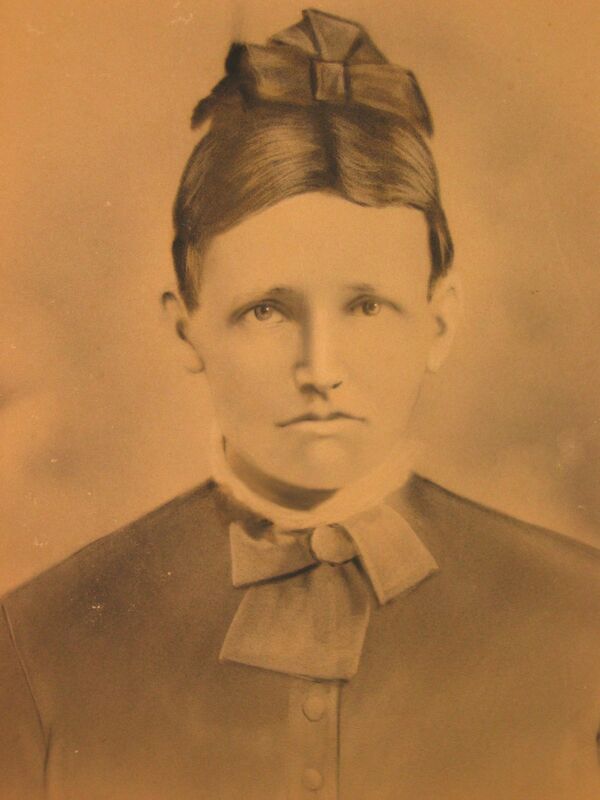 My grand-great-grandmother, Martha Jane Tucker. The “unknown woman in the portrait” who first ignited my enthusiasm for genealogy.